Modern techniques of surgical hair transplantation can restore lost hair and replace or re-shape your hairline with your own natural, growing, permanent hair, which needs no more care than the ordinary washing, styling, and trimming you have always done. Transplantation can be done today so well that often a barber or stylist cannot even tell that grafts have been placed. Hair naturally grows, in clusters of one, two, three, and sometimes four hairs, these clusters are called “follicular hair units. This procedure imitates nature by relocating these naturally occurring “follicular hair units” from the donor area (i.e. the back and the sides of the head) to the recipient site (balding area). It has been shown that when single-hair micrografts are generated from breaking up larger follicular units, their growth is less than when the follicular units are kept intact, demonstrating the fact that “the whole is greater than the sum of the parts” and supporting the concept of the follicular unit as a physiological entity. The follicular unit grafts are trimmed under magnification and have a better hair /skin ratio. This allows the surgeon to keep the recipient sites small and space them closer together, while at the same time maximizing the amount of hair that can be placed into them. A large number of grafts, up to 2000 grafts can be transplanted in one session. Once the hair growth starts these transplanted follicular unit grafts are indistinguishable from the natural groups of hair in the nearby area. Practiced by an experienced and skilled hair restorative surgeon, follicular unit transplantation can produce a look that is undetectable and completely natural, making full use of the patient’s donor supply in the least number of sessions. Men or women who want to restore or change the shape of their hairline(advancing the hair line). How do i know if i am a good candidate for hair restoration surgery? The elements that Dr JMJ assesses to determine whether you are a good candidate include such things as: your general state of health; hair’s texture—fine or coarse; the contrast between the your hair color and skin color; the density, i.e., the number of hair follicles per square inch of the hair in the donor area; the size of the area to be covered; the size of the area of donor hair; whether or not previous grafting procedures have been done; and your goals and expectations. Making an accurate diagnosis and making treatment recommendations require an examination by doctor and a frank discussion of possibilities between the patient and the doctor. Dr JMJ will also give you a realistic estimate of the total cost of the planned procedure or procedures. One must understand that transplantation redistributes existing hair follicles and cannot create new hair follicles. Hair transplantation surgery is considered to be “minor out-patient surgery.” Hair transplant procedures can take from 4–8 hours and are usually performed using local anesthesia on an out-patient basis, occasionaly with some supplemental oral or IV medication. Patients are awake as usually no sedation is used. There is typically little discomfort during the surgical procedure. The donor areas, where the grafts have been harvested, are usually closed with sutures. These are usually removed in 7–14 days. Dissolvable sutures may occasionally be used in order to eliminate the need for you to return for suture removal. The recipient sites, where the grafts are placed on top, are essentially small, superficial needle holes or slits in the skin of the scalp. After a light breakfast you are expected to report to the hospital by 8.00 am. A staff of the Hair Restoration team will receive you. All the necessary paper work and formalities will be completed at this time. By 8.30 am Dr JMJ will meet you and review the plan for your hairline and discuss the number and placement of the grafts. You will be asked to change into medical gown/hospital clothes and a shot of premedication is given to you. The hair in the donor area is trimmed and you will be asked to have a head wash with a medicated scrub. After drying your hair you will be seated in a chair that is very similar to the dentist’s chair. Your vital signs (pulse, blood pressure) are checked. An IV line is secured. For the initial part of the procedure the chair will be completely flattened and you will be asked to lie with your face down. After making sure you are comfortable Dr. JMJ will inject the local anaesthetic on to the prepared area on the back of your head. In all likelihood, the injection of the local anesthetic is the only part, in which you will feel an occasional sharp but tiny pain. By now the back of your head would feel numb and after confirming this Dr JMJ would proceed with next step of the surgery. Using a scalpel a strip measuring 1 cm - 1.25 cm wide by 15 cm long (on an average) is removed from the donor area. Because the strip is so long and thin, the donor defect is not wide, so closure is possible with very little tension. The donor area is closed with stitches, in two layers, an inner layer of absorbable sutures and an outer layer of non absorbable sutures, which would need removal. 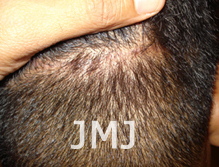 Dr JMJ uses the method of Trichophytic closure, a method by which the scar will not be hair less and hence better concealed. What is done is that 1-2mm of the top edge of the donor defect is trimmed off. This transects a row of 1-2 follicular units, which then grow through the eventual scar, thereby dispersing its obvious linearity. Throughout this part you would not have felt any pain. 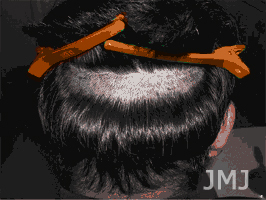 The suture line is well covered by the hair around it and is not visible ordinarily and in time, would be virtually impossible to detect it even if one were to look for it while combing. At this point you will be allowed a break and you could take some refreshments and generally relax. The donor strip will be divided into slices or slivers, maintaining the integrity of the follicular units. Dr JMJ himself does this important step using magnification. These slivers are then handed over to trained assistants, who separate the slivers into follicular micro grafts, which contain 1, 2, 3 or 4 hairs. It requires several trained assistants to prepare on average 1500 – 2000 grafts. While the assistants are preparing the grafts, Dr JMJ will start the anesthetization of the recipient area. You will receive a couple of shots over the front, above the eyebrows and some over the top. Again these needle shots may give you a few sharp pains but only temporarily. Once the anesthesia takes effect your scalp will be completely numb. 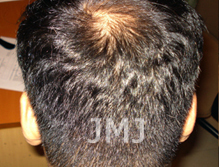 The size of the grafts allows Dr JMJ to place the grafts as close as it is possible with minimal injury to the scalp. Graft placement will take 2-4 hrs depending on the number of grafts. You can spend this time listening to some light music. During this period if need be you may take a break and have some refreshments. By 2.30 pm all the grafts will be in place and after reviewing the grafts you would be sent out from the hair restoration room. There is no dressing on the grafted area. A small dressing is kept on the donor area for the first 48 hours to soak any collected blood and prevent soiling of the pillows. You may wear a lose cap with prior approval from Dr JMJ so as to prevent the grafts from sticking to the cap. You will receive a painkiller before you leave the hospital premises. You will be advised to take antibiotics for five days to prevent infection of the grafts. Painkillers may be required on the first few days. Cold compresses over the forehead are helpful. After changing into your clothes, by 3 pm you will be ready to go home. Though it is possible for you to drive, it is not recommended and it is better to have someone pick you up and drop you home. Hair transplantation is a very safe, relatively minor surgical procedure. Significant complications are extremely rare. There is usually little or no discomfort in the grafted area. Most patients feel some “tightness” in the donor area for 1–2 days and are prescribed a mild analgesic to help cope with this. Patients may be asked to use moist compresses or sprays and to sleep in a semi-upright position for 2–3 days following the procedure to minimize swelling and bruising. Small crusts may form on each graft, and these can usually be camouflaged by any existing hair that can be combed over the recipient area, or with camouflage products such as HAIROUSE, DermMatch, Couvre, or Toppik. 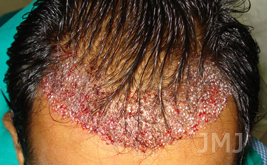 These crusts will flake-off by 5–14 days after the surgery, the smaller follicular unit scabs often falling off at 4–6 days and the multi-follicular unit scabs taking longer. The transplanted hair seen growing out of the scalp may initially be shed; however, the roots remain and will be dormant for 10–14 weeks, at which time the new hairs will all begin to grow. Numbness that may occur in the donor or recipient area usually disappears within 2–8 months following surgery. As stated above, complications are rare. Minor inflammation can occasionally occur around a newly transplanted hair follicle, similar to an infected ingrown hair or pimple, and usually responds to simple warm compresses. 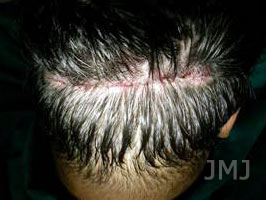 The scar that occurs in the donor scalp as a result of the removal of donor skin is usually quite narrow and can be easily hidden by the surrounding hair. The graft sites in the recipient frontal area heal with almost no visible scarring and are covered by the transplanted hair. A minority of patients may experience mild swelling in the forehead area for a few days following surgery. It typically appears around the 3rd post-op day and goes away after 3–4 days. Infection in either the donor or recipient area is extremely rare. Many patients experience a small area of numbness above the donor scar and in the rear central scalp that gradually disappears after a few months. Mild “Shocking” (shedding) of Existing weak Hair causing them to drop out for 3 months, after which they grow back. Minor and trivial side effect: Itching in the area of the new grafts or along the donor scar may occur occasionally.